Dragon Soul Alchemy is a system designed for high level players with the purpose to strengthen your char in a certain direction. Characters from level 1 can use the DSS. Cor Draconis (Rough) in return. After this quest is completed, the player has now access to the Dragon Stones Alchemy Inventory by clicking the button on inventory , the button in the chat bar , or using the "O" key shortcut. The higher the class the more bonus the dragon stone will have. The higher the clarity the higher are the bonus on the dragon stone. The higher the level the higher are the bonus on the dragon stone. 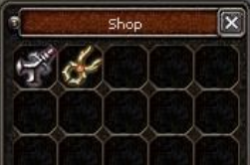 The level can only be seen in the item description. Bonus: You can change the bonus of a Mythical Dragon Stone with this divine flame. required depends on the clarity of the stone. There are six different types (onyx, diamond, ruby, jade, sapphire and garnet), each has a different effect. These are the examples of the max bonus the stones can give, for a complete listing of all possible bonus on all stages click the links of each type of stone. 8% Chance to restore SP. Cor Draconis (Rough) The crystal dragon heart contains a random Dragon Stone from the rough class. Cor Draconis+ (Normal) Powerful Cor Draconis. Rank: normal. Contains a Dragon Stone of the class rough to cut with a random clarity grade. Cor Atrum+ (Normal) Powerful Cor Draconis. Rank: normal. Contains a Dragon Onyx of the class rough to cut with a random clarity grade. Cor Diamas+ (Normal) Powerful Cor Draconis. Rank: normal. Contains a Dragon Diamond of the class rough to cut with a random clarity grade. Cor Granatum+ (Normal) Powerful Cor Draconis. Rank: normal. Contains a Dragon Garnet of the class rough to cut with a random clarity grade. Cor Jadeit+ (Normal) Powerful Cor Draconis. Rank: normal. Contains a Dragon Jade of the class rough to cut with a random clarity grade. Cor Rubinum+ (Normal) Powerful Cor Draconis. Rank: normal. Contains a Dragon Ruby of the class rough to cut with a random clarity grade. Cor Saphirum+ (Normal) Powerful Cor Draconis. Rank: noble. Contains a Dragon Sapphire of the class rough to rare with a random clarity grade. Dragon Chest+ (Multi-Coloured) The azure blue chest contains a powerful Cor Draconis in every colour of the "normal" rank as well as a Green Dragon Bean. 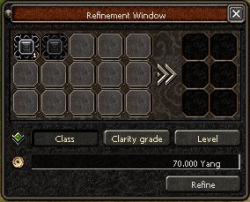 Put the needed dragon stone in the appropriate slots and click “refine”. 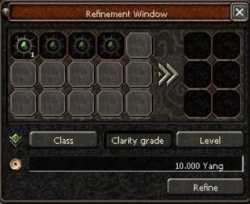 Put the bean and one dragon stone in the appropriate slots and select “refine". 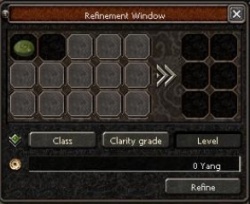 The refinement can fail, in this case The dragon stone level is reduced by or remains unchanged. You can equip 2 sets of dragon stones. To equip the dragon stone you simply have to drag the dragon stone into the corresponding color slot in the chosen set. To activate the chosen set of dragon stone, you only need to click on “Activate”. Once you activate the set, the time start expiring and a buff is visible on the top left of the screen. The symbol of the buffs is the same as the set you activate. You can’t activate both sets at the same time. 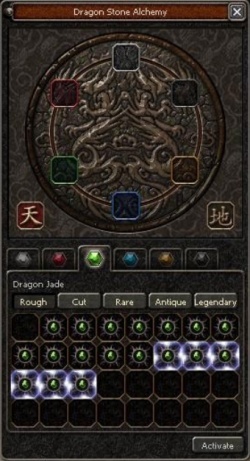 To unequip the Dragon Soul Stone you can drag the stone from the top panel to the below panel, or right click on it. drag it on the non equipped Dragon Soul Stone (the stone will be removed from your DSS inventory and the elixir will appear in your inventory). Time Elixir- will allow you to extend the time of the legendary dragon stones by 5%,15%,30%,50%,100%. The extension is random and in percentage. Extraction can fail. You can use the Elixir by dragging it on the equipped stone. This page was last modified on 26 February 2019, at 00:44. This page has been accessed 251,503 times.